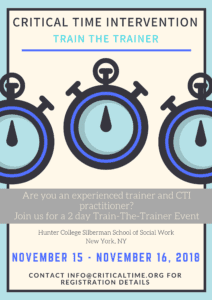 This fall, CACTI will be hosting a two-day Train-The-Trainer (TTT) event for experienced CTI practitioners! The training will allow individuals to become certified in training CTI workers, an especially valuable asset to have in-house for agencies unable to continually pay for external trainings of new employees. Previous training experience is preferred, but not required. Online registration & payment here! Please contact info@criticaltime.org with all inquiries.